What is it about the color red that throws us into a confusion of mis-labeling? Purple onions are called “red onions.” Purple cabbage is called “red cabbage.” In Korea, black tea is called “red tea” (hong-cha). 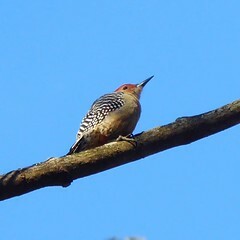 And those obviously red-headed woodpeckers are called “red-bellied woodpeckers.” Mighty Cthulhu! As for there being a world of secret lives: I suspect that there are large, conspiratorial communities of animals out there, regarding our civilization with envious eyes and slowly, surely drawing their plans against us. 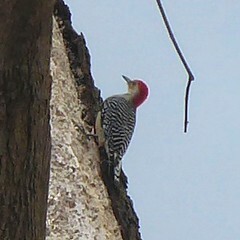 There is a woodpecker with a completely red head, and they were named before red-bellies. 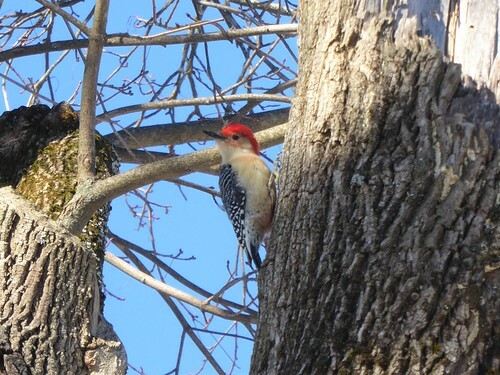 Both birds were named in the days when ornithologist used guns, not binoculars, to study birds, and if you hold a red-bellied woodpecker in your hand, they have a tinge of red on their bellies, by their legs. But you can’t see if while they’re clinging to trees.